Not too long ago, I shared a Cabernet Sauvignon Vertical tasting that a group of us had done. Well, it was time to try that again. I am always experimenting with food and wine, and the vertical tasting format is a great way to try one vintner's wines, and see how they change with the different vintages, while pairing them with different types of food. This time around, I was able to pick up a five year vertical of Sempre Vive Cabernet Sauvignon (2002-2006). I must admit that I wasn't familiar with this winery, prior to our tasting. So, a little research, and I found that their Cabernet comes from vines planted in 1971. What was intriguing was that they use their own Cabernet clone, known as the "Albie Romeo Old Vine Clone". The vineyards are located on the north end of Napa Valley in Calistoga. Vintages were also involved in my decision to purchase the wines. The 2002 vintage was a strong one, with long hang time, producing concentrated fruit flavors and intense color. The 2003 vintage was an uneven growing season, producing mixed results. 2004 was an early harvest season, but it was also an early budding season, so hang time was normal. The crop was smaller than normal, but led to nice fruit. The summer of 2005 was very cool, and the grapes struggled to ripen, until a late summer heat wave hit, producing a larger than normal harvest. The final vintage, 2006, was another uneven growing season, with harvest time rain (which can dilute the juice). Each vintage offered its' own challenges, so I thought this might be a great vertical to see the affects on the final product. Each couple was to bring some type of food to pair with the five wines. The first course was an Eggplant Involtini with an Italian tomato sauce. Second course was a Spinach and Walnut cake in Red Pepper sauce. The main courses were Blue Cheese Crusted Filet Mignon with Port Wine Sauce and caesar salad, and Grilled rack of Lamb with a choice of dipping sauces: mint chimichuri, pasilla chile with garlic, and yogurt with rosemary and thyme. For me, the classic pairing of lamb with Cabernet Sauvignon was outstanding. All the entrees worked, but I would change the spinach and walnut cakes a bit. They were a bit too vegetal in flavor...next time maybe a more bitter vegetable. In front of each place setting were five glasses, which immediately filled with each vintage (from left to right). As the wine opened up, the dinner was prepared, and served. On first taste, all the vintages were pretty much the same. We expected variation, and that didn't seem to exist. After about half an hour, the differences started to show. 2002 - Medium intensity with a remarkable amount of black fruit of plum, blackberry and black cherry. Some age showing, with a touch of tobacco, leather, spice. Nice complexity, moderate tannins and a long satisfying finish. 2003 - More fruit forward than the 2002. A bit watered down but dry with full body of cassis, spices. Moderate tannins, and a fading finish. 2004 - Medium + body and moderate tannins. Lots of berry flavors, cassis and chocolate. A slight spiciness that reminded me of a low alcohol Zinfandel. and a bit of cherry on the finish. 2005 - Medium bodied. Was okay but has some of that green bell pepper aroma that can be picked up in Cabernet, along with a bit of black cherry and plum. This one had the most notable oak influence. The finish was a bit short. 2006 - Medium + body with full flavors of black cherry, plum, and cassis and a touch of spice. Nice acidity and moderate, smooth tannins. The fruity finish was long and would would hold on to this vintage a while longer..
We ended with our ever continuing search to find the best dessert to pair with Cabernet. Blackberry cobbler and chocolate cake were served, but once again, it came down to the simple items. The best dessert pairings were dark chocolate covered blueberries/Acai, Bittersweet chocolate wafers, and just straight dark chocolate (70% cacao). At the end of the evening, we took a vote on our favorite vintage. Every one of us felt the even year vintages were the best. The least favorite vintage was the 2005. The favorite vintage was 2002 (seven votes) and one vote for 2004. 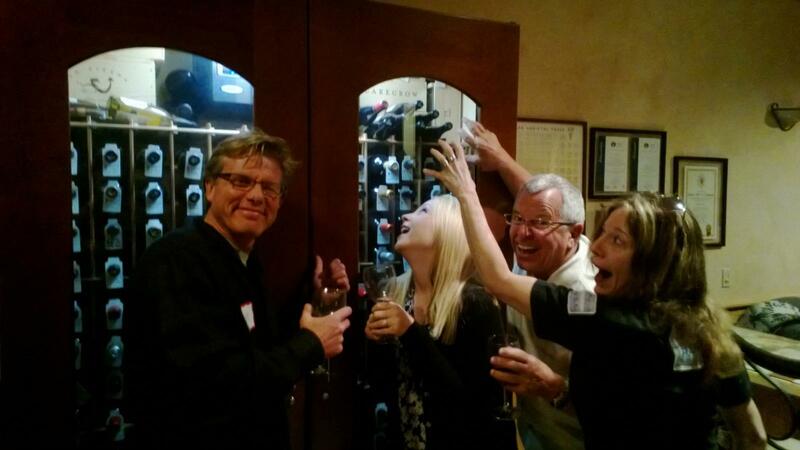 It's going to be hard to beat the last wine tasting event held by the Arrowhead Wine Enthusiasts. We decided to do a French wine tasting, and charge the unheard of price of $20/person. Normally our tasting fee is anywhere from $10 to $15, but I wanted to show the group how good French wine can be. In the past, a $10 tasting fee for French wine would only get some basic Haut-Medoc Bordeaux, or the oddball Provence wine. But $20....I can do something with that! When I headed to my favored wine shop, I had in mind what I wanted the group to try, and I knew I would be challenged even at $20/person. I spent an hour and half in the wine shop, reviewing potential candidates for our French wine tasting, and narrowed it down to five wines, that I felt were good representatives of French wine. When the night arrived, I had 53 people at my house. Each was asked to bring an entree, appetizer or dessert that were in keeping with the French theme. Surprisingly, only one person brought Brie, and only one caviar dish. As the evening began, each guest had a taste of our first wine, the Heidsieck NV Blue Top Monopole Brut Champagne. This sparkler is the entry level for Heidsieck and Co., but offers that autolytic character (yeastiness) that one expects from Champagne. The wine was dry, with some minerally notes, and a touch of apple and citrus. Nice acidity, structure and a moderately long finish. There was some questions about the word "monopole". This simply means that the winery controls the vineyard and the production. In Champagne, many wineries purchase their grapes from co-op houses. Our second wine moved a little south and west from the far northern reaches of Champagne. Our least expensive wine of the night came from the Loire, and more specifically from the Touraine region. Chenin Blanc and Sauvignon Blanc are the primary white grapes for this region, and I went with a Sauvignon Blanc from Ricard Les Trois Chenes Touraine 2011. This one really surprised some people, not only for its' low price of only $15, but the fact that it is a very good wine. Crisp acidity, with grapefruit, minerals, and only a bit of that vegetal aroma you get with Sauvignon Blanc. This is a great summer wine! The stars of the evening were to be the three red wines. Our wine group is more red oriented to begin with. So, why not go big? I couldn't find any older vintages on the shelf, so the Vinturi aerators were there to help open up the wines. Our first red wine of the evening was fantastic. We opened with the Mongeard Mugneret Les Petits Monts Vosne Romanee 1er Cru 2009. At $95/bottle, this was "scary good". If only wine could be this good at around $25, I'd be drinking all the time! This is medium plus bodied Pinot Noir, from a vineyard, that is just above one of the best vineyards in Burgundy (Le Romanee). Lots of red cherry, earth, spices, and that all important "funk" you get from Pinot Noir. Nice acidity, and well integrated tannins, with a nice long finish. I could just sit and smell this wine all day, as it changes in the glass. The second red wine of the evening took us to the southwest of France, in to the left bank of Bordeaux. I wanted a wine that was somewhere between the power of a Paulliac and a Margeaux, and the obvious choice was to go to the commune between the two: Saint Julien. One of the best known Chateau in this region is Leoville Las Cases, but their prices were beyond reach for this tasting. The next best opportunity was to go with their second label: Clos du Marquis Saint Julien 2009. Again, a young wine, from a very good vintage, so it was pretty tight, and needs a lot of air in it. The dark red fruit, and fairly heavy tannins, were a nice contrast to the previous wine. This one really needed more time, but is well worth adding to your cellar...if you can keep your hands off it for 8 to 10 years. Our last planned wine for the evening was from the Northern Rhone, home to Syrah. I chose the Francois Villard Cote Rotie Le Gallet Blanc 2009 to end the evening. This one got some interesting reactions. I didn't realize how many people were used to Australian Shiraz, or California Syrah. This didn't taste anything like those, and that was a pleasant surprise to most of the tasters. This wine was also very young. The color was deep purple, emphasizing the black cherry, and blackberry notes. Very fruit forward, with some hints of oak, meat, and spice. Tight tannins, that should mellow with age. Again, this is one to buy and hold. While all the wines that were planned for the evening were outstanding, we had a few little "tricks up our sleeves". Two of our members brought some older vintages to share with the group. The first two bottles were purchased at a local charity event, so the provenance was questionable. Both bottles were from Bordeaux, and the 1985 vintage. They were Chateau Mouton-Cadet and Chateau Certan de May (Pomerol). The first was over the hill, The cork broke upon opening and the wine was oxidized. The second wine was from the right bank, and mostly merlot based. It held up surprisingly well. It was a bit "skunky" upon opening, but soon opened up to a little bit of red fruit,and smooth tannins. Medium bodied, with a medium finish. 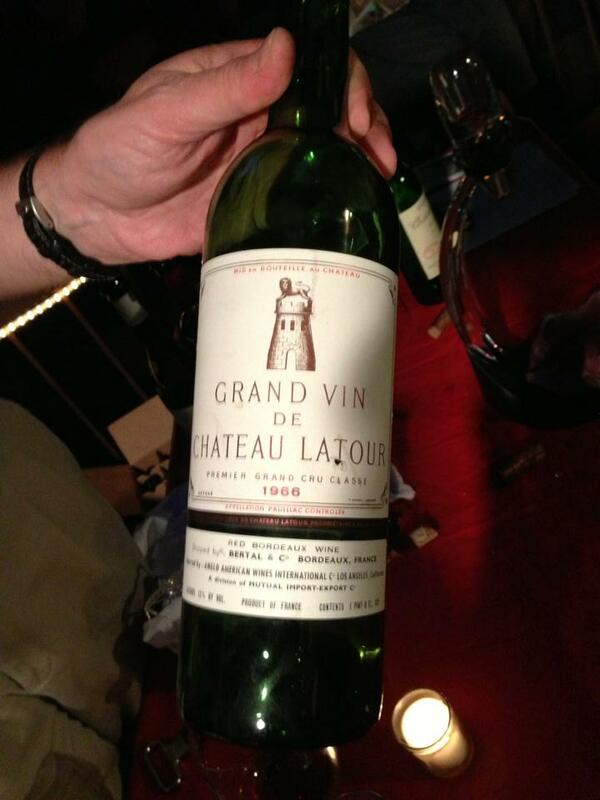 The culmination of the evening occurred, when we pulled the cork on the Vin du Chateau Latour 1966. I had opened previous bottles of this wine, and the cork had failed. This time, the cork came out in one piece, but was stained to within 1/4 inch of the end of the cork. I wasn't holding out much hope, but after decanting the wine, the color looked good. The nose was a bit musty (anything corked up for 47 years would be expected to smell the same). Then the taste....it held up! Most of the fruit was gone, but amazingly, the tannins were still there. Nice velvety texture. A real treat, shared among a large group of tasters. We all got a small taste of history this night. While I was conducting the tasting, some of my friends decided to venture down to my wine cellar. Luckily, I hid the key. But, the joke's on them. After they left, and only a few people remained, I opened up the cellar and pulled out a 1983 Opus One. I know it's not French, but it was a nice way to end the evening. Those of you in Southern California know what I’m talking about, when I quote this old song from 1958. This last weekend it was a 26 mile trek across the channel to Two Harbors on Catalina Island for the 12th Annual Summer Wine Festival. 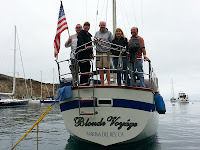 A friend of mine owns a 42 foot Irwin Sailboat (the Blonde Voyage), and invited us to join her for a 3-day trip to Catalina Island, and a little wine tasting. Well….wine tasting, beer tasting, food, sea, and sun to be more accurate. We left Long Beach’s Alamitos Bay on Friday morning. Before even hitting the breakwater, we each opened a bottle of beer, made a toast to Neptune (and Poseidon) for a safe voyage across the channel. Each person took a drink, and then we poured the remaining portion in to the ocean. The seas were calm, and we motored for the first three hours. 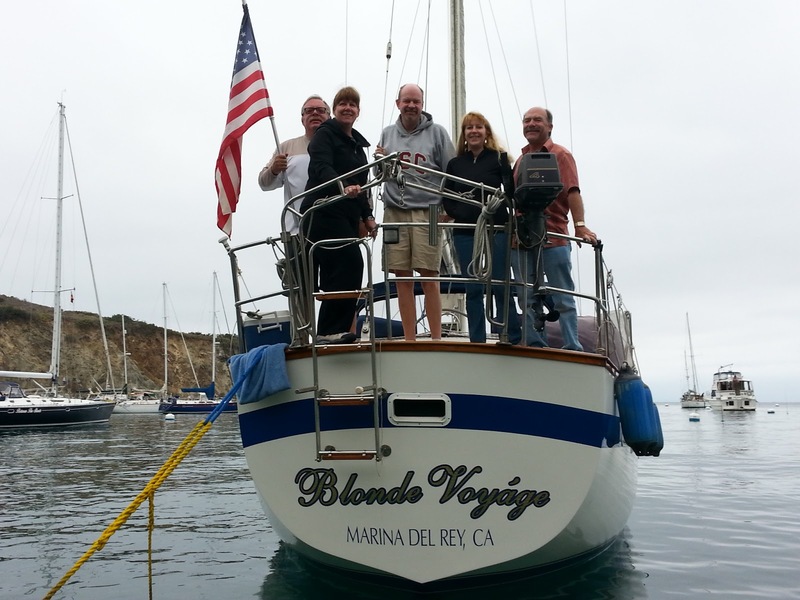 We caught some wind, and sailed the last 1 ½ hours into Cherry Cove on Catalina Island. Upon reaching our mooring, we once again toasted Neptune with cranberry martinis. We headed to shore to pick up our friends dingy, and had to stop at the bar to try two local specialty drinks. The first was called a “Gatorade shot”. While I see no similarity to the thirst quencher, we did learn that before you down the shot, you must say “waka waka”. This was soon followed by the island special, known as a “Buffalo Milk”. It was more of a dessert drink, with whipped cream and grated nutmeg on top, along with a splash of liqueur de Cacao. Dinner was on the boat the first night, and grilled filet mignon paired nicely with the Buscador Pinot Noir and the Ancient Peaks Oyster Ridge. As the sun set, we looked forward to Saturday’s wine tasting event. 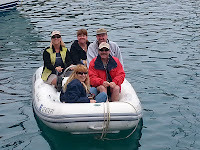 The Two Harbors Wine Festival is sponsored by the AvalonRotary Club and the Santa Catalina Island Company, as a fundraising event for local community programs. Tickets went on sale in May, and by the time the line had formed to get into the event, there was a long waiting list for tickets. All 500 tickets had been sold, prior to the event day. As we entered the fenced area on the beach, we were handed our wine glass, and a program which listed more than 30 wineries/distributors. The listed included wines from Avenui Brands, Bonterra Vineyards, Brander, Coastal Wine Brands, Delicato Family Vineyards, Don Miguel Gascon, Don Sebastiani & Sons, Fetzer Vineyards, Iron Horse, Jekel Vineyards, J. Lohr, Lincourt, Michael David Wines, Old Bridge Cellars, Parker Station, Rusack Vineyards, Starborough, Ste Michelle Wine Estates, Thomas Scott Wine Cellars, Treasury Wine Estates, and one brewery: Belmont Brewery. Included in the $40 admission were live music, and all you could eat appetizers of cheese, cracker, meatballs, shrimp, ceviche and fruit, provided by the Harbor Reef Restaurant. In addition, Mad Mikes Gourmet Sausages were there from Temecula. They took groups of six people, and tasted samples of their sausages. I must admit that their bratwurst is one of the best I’ve had….just melted in your mouth. I just wish I had some Riesling to go along with it! A silent auction with Catalina items appealed to a lot of the crowd, who kept returning to their favorite item, to make sure they weren’t out bid. Of course, for us, we were there to taste wine. The event is aimed at appealing to every type of palate. There were fizzy Muscats, to deep dark Petit Sirahs. Most of the booths were represented by distributors or friends of the winery. Only in a few cases did I talk with anyone who knew a lot about the wines being served. I was only able to get to about 20 tastes in the three hours of the event. Out of those wines tasted, I came across one bottle that was tainted (volatile acidity). Some of my favorites for the tasting were the Greywacke Sauvignon Blanc from New Zealand, and very yeasty Iron Horse Ocean Reserve Sparkling wine, and my favorite of the day was the Don Sebastiani B-side Cabernet Sauvignon. For about $25, you can’t beat this Napa Cab, with its’ dusty tannins, black fruit and chocolate. After the event, we hit the bar to “cleanse our palates” with a margarita, then off to dinner at the only restaurant on the isthmus, TheHarbor Reef Restaurant. Calamari steaks paired with a Santa Ynez Sauvignon Blanc ended our time on the island, and it was back to the boat for a final glass of Dragonette Cellars Rose, and a toast to the sunset, good friends and a great trip. Sunday morning came too fast, and we needed to pack up everything for the boat trip back to the mainland. The winds remained calm, and we made our voyage toast to Neptune with some homemade Bloody Mary’s. About three hours out, we came upon a pod of dolphins, and followed them for a while, before returning to Long Beach, and a return to reality. Next year, plan on scheduling your trip to Two Harbors for the annual Wine Festival. The event is aimed at appealing to every connoisseur’s palate, the festival has become one of the “must do events” while visiting Catalina.